“Ball hawking,” or looking for lost balls and using them as your own will save you money, but it won’t help your game. Different balls are suited for different styles of play. Don’t settle for just any ball unless you are willing to settle for just any score. Innovation in golf ball design and construction in the last few years has led to a marketplace filled with hundreds of choices. That can make choosing the right ball a bewildering experience. However, a little knowledge can go a long way toward helping you find the ball that is right for you. Compression has to do with how much the ball compresses (it actually distorts and spreads across the clubface) when it is hit. Golfers with high swing speeds compress the ball more than those with slower speeds. So a softer ball with lower compression makes it easier for golfers with slower swing speeds to distort the ball and get it airborne. However, low-compression balls do not create much spin, which can be problematic later when trying to control the ball on the green. These are all players likely to have swing speeds under 80 mph. Low-compression golf balls will greatly improve the ability of these players to hit the ball greater distances. More experienced players with greater swing speeds will want a high compression golf ball, which gives the ball more spin. Spin gives an experienced player more control, especially on the green. If you’ve ever dreamed of a miracle ball that could keep your ball going on the straight and narrow; dream no more. Though not without controversy, there is a ball designed to help golfers hit the ball straighter every time—the Polara Ultimate Self-Correcting ball. It’s not approved for USGA play, but many amateur players, especially those new to the sport, say it allows them to spend more time actually playing instead of spending most of their time searching for balls lost in the woods. Still, others believe it is akin to cheating. Perhaps it depends on what you are looking for in your golf outing—entertainment and exercise, or joining in the grand tradition of the sport. Each player must make that decision on his or her own, but the technology is there for the asking. There are other factors that affect the play of a ball. Dimple patterns affect flight and how well a ball sticks to the green. Different manufacturers create different patterns to achieve a variety of results. Temperature can also affect ball performance. 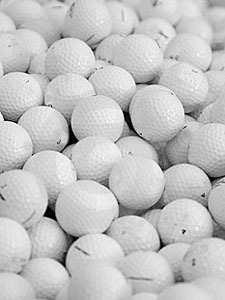 The materials used to make golf balls are more flexible in warmer temperatures. This means they will distort more upon impact and fly higher and farther. So, if you are playing in temperatures less than 50 degrees, you may want to choose a low compression golf ball (softer and more malleable) as it will perform better than high compression golf balls under chilly conditions. When performance is not an issue, a lot of fun can be had with a golf ball. Personalize them for bachelor/ bachelorette parties or fundraising tournaments. Or slip an exploding or non-puttable ball into the mix and see what happens.